Dimensions: 2 Chaise Lounge: 77"L x 35"D x 28"H; Coffee Table: 34" x 34" x 12"
Notes: In Stock and available for immediate delivery. Ships within 5-7 days. Please call to place your order. Set includes 1 coffee table w/ Glass Top and 1 sofa. Our weather resistant set is made with an aluminum frame and synthetic wicker. Set includes water repellent cushions in beige. Also view our other synthetic sets online: Item# 1991, 2017, & 2019. Notes: In Stock and available for immediate delivery. Ships within 5-7 days. Our synthetic Dining set sits 6 people comfortably. 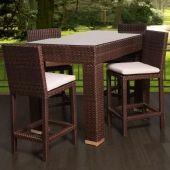 Made with Synthetic Wicker and an Aluminum frame, this set is ideal for outdoor areas. Dimensions: Corner: 32" x 32" L x 27" H; Middle: 32" x 28" x 27"; Ottoman: 28" x 28" x 12"
Notes: Ideal for outdoor/indoor use. Sectional consists of 5 pieces with coffee table. Additional side chairs available. Polyester cushions are water repellent. Dimensions of matching coffee table is 28"w x 28"L x 12" H.
Also view alternative synthetic sets on our site: Item# 1991, 2007, & 2019.